KIEV, Ukraine — Yulia, Kostiantyn and their daughter, Valerie, don’t look like a typical refugee family. New Jewish immigrants from Ukraine walk on the tarmac after landing at Ben Gurion Airport in Lod, Israel. All well dressed — even the Chihuahua, Micky, wearing a chic dog jacket — they might not seem out of place mingling with Kiev’s oligarchs. But the truth is that the family, Ukrainians of Jewish heritage on one side, has lost almost everything since clashes between pro-Russian separatists and Ukrainian nationalists caused it to flee to Kiev five months ago from the eastern city of Luhansk. 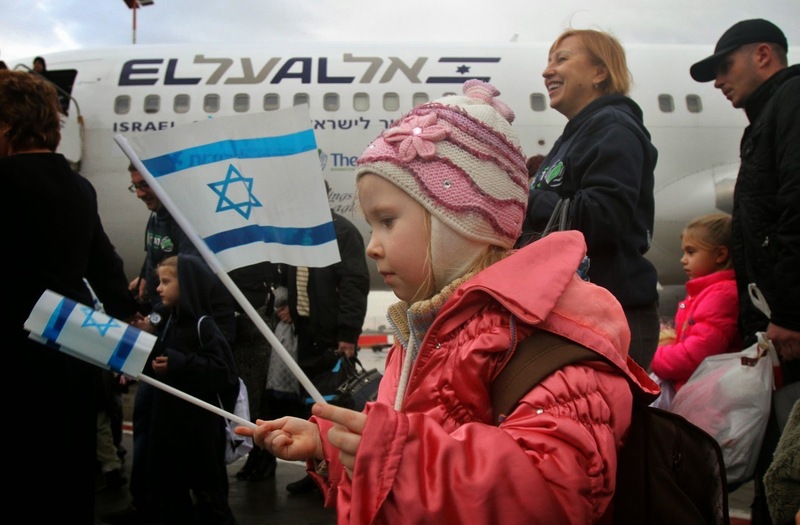 So on Monday, parents, daughter and dog — with 226 other Ukrainian Jews — left Kiev for Israel on a charter flight funded by a Christian-Jewish charity. In Israel, a government agency waited to help them start a new life. The new arrivals joined more than 5,000 Ukrainian Jews who have moved to Israel in the past year, about 1,300 of them from eastern areas claimed by separatists. The number of Ukrainians arriving in Israel in 2014 is more than double that of the previous year. The Ukrainian government, which is facing an economic crisis, has little means to help those internally displaced by the war, now about 500,000, according to the United Nations. But groups such as the International Fellowship of Christians and Jews (IFCJ), which has spent more than $2 million on resettlement flights in the past year, and the Jewish Agency for Israel, a nonprofit organization that supports Jewish communities around the world, have stepped in to aid those of Jewish heritage. The Israeli government also offered the option to resettle in Israel. That assistance has meant that 70 years after the Holocaust wiped out some 900,000 Jews in Ukraine and 20 years after 1 million Jews — forced to suppress their religious identities under Soviet rule — left the former Soviet Union for Israel, the Jews that remained are among the luckier Ukrainians. “Since I was small, my grandmother always told me to hide the fact I was Jewish,” said Kostiantyn, 33, who asked that his family name be withheld out of concern for relatives left behind in the conflict zone. The family had just reached its goals, Yulia said. Her husband had recently invested $14,000 in a new private dental practice, they finally owned a home, and their daughter had received the puppy — when the conflict erupted last spring. Weeks of rocket fire and no electricity, water or communication soon combined with a growing sense of insecurity as armed militiamen roamed the streets. The family had to leave, Yulia said. “We had just started fulfilling our life’s dreams,” said Yulia, 32, whose lineage is not Jewish. She, her husband, their child and the dog left for Kiev on Aug. 2, hoping that the unrest would soon pass and that they could return home. But as the fighting continued, they realized that going back to Luhansk was impossible. By October, they had used up much of their savings escaping the war zone and then paying rent in Kiev. So when they discovered that Kostiantyn’s Jewish heritage made the family eligible for Israeli citizenship, they opted for stability in Israel over uncertainty in Ukraine. Natan Sharansky, a former Soviet dissident from Donetsk in eastern Ukraine who moved to Israel in the 1980s and is chairman of the executive of the Jewish Agency, recalled a recent conversation with non-Jews who also fled eastern Ukraine. “They told me it was not fair that Jews had such special privileges,” said Sharansky, who has visited Ukraine several times in recent months. Israel, which sees itself as a haven for Jews under threat, has deemed the situation in Ukraine a crisis. In recent months, the immigration process has been eased for Ukrainian Jews. “We recognize that the situation is very hard, people have lost their homes, their property, everything that they built in their lives,” said Israel’s minister for immigrant absorption, Sofa Landver, who accompanied the migrants from Kiev to Tel Aviv on Monday. With an additional $8 million to $10 million in donations, the IFCJ in coordination with the Israeli government plans to sponsor additional flights of Ukrainian Jews to Israel, at least one a month for the next year. “Christians supporting immigration of Jews to Israel is nothing new,” said Rabbi Yechiel Eckstein, president of the IFCJ, whose donors are mainly U.S.-based Christians. Alexander Hayduk, a doctor who also fled Luhansk, arrived with his wife, Anna, and their 11-month-old son, Kirill, in Israel on Monday. “I feel lucky that I have the option to leave and start again,” said Hayduk, 32. But not all Jews are choosing to leave. The Jewish Agency estimates that at least 200,000 Ukrainians are eligible to migrate to Israel under its “Law of Return,” which allows people with at least one Jewish grandparent to receive citizenship. For Yana Erovteva, 48, who fled Luhansk in August, the decision to leave Ukraine is painful and is one she is not quite ready to make. Her visa for Israel is ready. But her son, Roman, 30, went missing in Luhansk after a fierce battle there one day in the summer. “We’ve looked for him everywhere, on lists of dead people, but his name was not there. We think one of the militia groups took him,” said Erovteva, who now lives in Kiev. For now, she said, she can’t give up hope until she knows what happened to him. This leaves her departure for Israel in doubt. In the meantime, several Jewish organizations are helping, providing money to replace winter clothing left behind when she fled to Kiev and paying the rent for her apartment. For those who have chosen to start over in Israel, the move comes with a mixture of emotions. “Of course we are sad to leave Ukraine. We have all our family and friends there,” said Anna Hayduk, 29, who worked as a financial adviser in Luhansk, as she waited for the plane to take off from Kiev for Tel Aviv. Yulia and Kostiantyn’s daughter, Valerie, 10, held Micky the Chihuahua tightly as she disembarked from the plane a little more than three hours later. She said that moving to a new place for the second time in four months is scary. “I only know a little bit about Israel,” she said. It may help - in understanding what is going on - to properly identify the issues and the protagonists. It is now well recognized and accepted that Russians, Russian-funded mercenaries, Russian military personnel, Russian equipment, Russian armaments, Russian money, Russian planning, and Russian intelligence -gathering is fundamental to the start and continuance of what (otherwise) would have been a regional disagreement in one country. To bring it closer to the blog writer's own perspective, it would have amounted to little more than Governor Perry's threats of Texan secession and Washington's disregard for his comments. All surveys that had ever been held in the Donbass area from the time of Ukraine's independence have shown that a minimum of 70% of the people there wanted to remain part of a unified Ukraine. This is hardly the substance of a "civil war". And - even if some of the more radicalized local hot-heads had wanted to set off some fire-works - it would have ended very quickly......but for Russian intervention. So, before making reference to "nationalists" and "pro-Russian" separatists, it may help - for purpose of accuracy - to recognize this as a Russian war of aggression against any form of Ukrainian insistence on its own separate national life - a parting of ways from its northern neighbor. It is sad when Ukrainian citizens - of any heritage - are forced to leave their country, but they are leaving not because of Ükrainian "nationalists" (the less than 5% of the voters who cast ballots for "nationalist"groups?! ), but because of Russian aggression against their homeland, and the resultant thuggery that has flourished there. Hopefully, the Jewish and Christian groups that are assisting in the resettlement of some Ukrainian citizens through emigration will also expand their efforts by helping those Ukrainians - of whatever heritage they may be - who chose to stay and resettle in their own country. They are also in dire need of outside support.